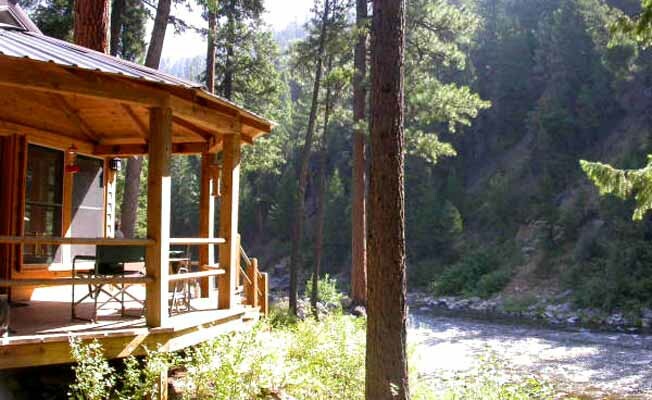 The Tailwater House offers first class accommodations in an unmatched natural setting. No dwellings are visible from the Tailwater; it is extremely private. The Tailwater offers all modern comforts and displays the hand-chosen accoutrements of a well-planned retreat. The Tailwater sits at the confluence of the West Fork of the Bitterroot River and Boulder Creek outside of Darby, Montana. Both watercourses flow out of the largest contiguous block of federally protected Wilderness in the lower 48 states, and meet one another at this very magical place. The Boulder Creek Trailhead into the Selway-Bitterroot Wilderness is a short walk from the front door. We purchased The Tailwater in 2006, and manage it as a family business. Our philosophy is one of sharing this special place for a reasonable price, rather than maximizing occupancy and income. We try hard to be conscientious stewards of The Tailwater and the ecosystem in which it exists. We ask that our guests do the same. It is our pleasure to share this special place and its inimitable moods and sylvan magic with you. We send our warmest thanks for your patronage. The Tailwater is a magical place. It will be love at first sight, cast, or swim for you as it was for us.